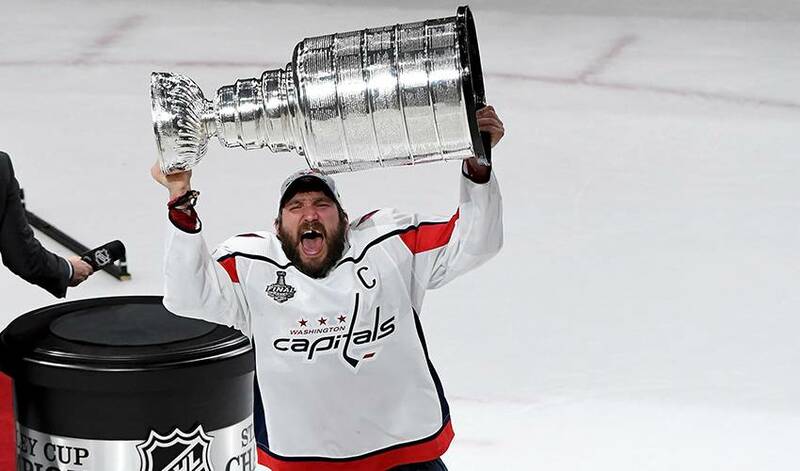 The Washington Capitals have won the 2018 Stanley Cup, defeating the Vegas Golden Knights in the Stanley Cup Final with a 4-3 victory in Game 5 at T-Mobile Arena in Las Vegas Thursday night. After splitting the opening two contests on the road, the Capitals returned to D.C. for the next two games, earning 3-1 and 6-2 triumphs, respectively, in Game 3 and Game 4. Washington, who celebrated its first Cup crown since joining the League in 1974, defeated the Columbus Blue Jackets in the Eastern Conference quarterfinals, their rival Pittsburgh Penguins in the semifinals and the Tampa Bay Lightning in the Eastern Conference Final, en route to the Cup Final. After a scoreless first period, the teams combined for five goals in the second frame. Jakub Vrana and three-time Ted Lindsay Award winner Alex Ovechkin tallied for the Capitals, but a Reilly Smith power-play goal with 29 seconds left on the clock gave Vegas a 3-2 lead heading to the third. Devante Smith-Pelly netted his seventh goal of the playoffs at 9:52 of the third period to make it 3-3, before Lars Eller (12:23) scored his seventh of the post-season to give Washington the lead for good. Ovechkin, who won three straight Ted Lindsay Awards from 2008-10, was named the Conn Smythe Trophy winner. In 23 playoff games, he recorded 15 goals (tops among all players) and 12 assists for 27 points. Congratulations to the 2018 Stanley Cup champion Washington Capitals, from the staff and members of the NHLPA.